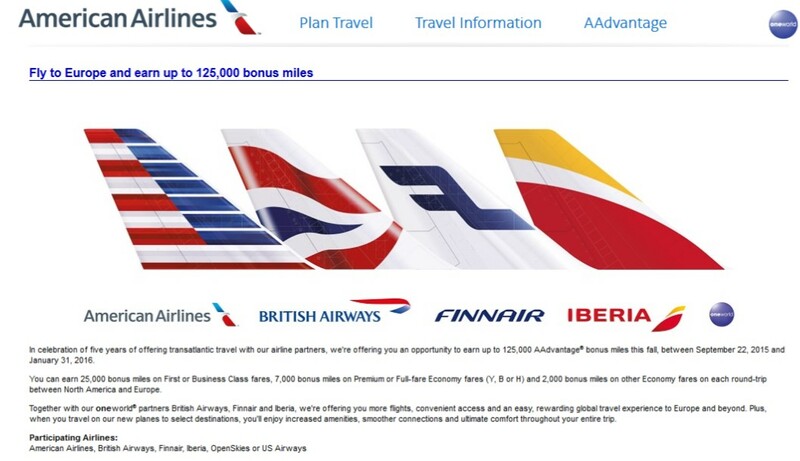 From now through the end of January you can earn up to 125,000 bonus American Airlines AAdvantage miles on flights to Europe when you fly with American, British Airways, Finnair, Iberia, OpenSkies or US Airways. Registration prior to travel is required. You can register HERE. The number of bonus miles you get depends on your class of service. To earn the full 125,000 bonus miles you’d have to fly in Business or First Class on five round-trip flights. For each Premium Economy or Full Fare Economy (fare classes Y, B, H) flight you can earn 7,000 bonus miles. And for all other Economy fares you’ll earn 2,000 bonus miles per flight. Note that those mileage figures are for each round-trip flight. The registration page has full information on which classes from the other airlines qualify for each of the bonuses. Even though I currently have no plans to visit Europe, I’ll still register because – why not, it’s free!